Democratic gubernatorial candidates Karl Dean and Craig Fitzhugh square off at Belmont University in Nashville, Tennessee, June 19, 2018. Belmont University, in partnership with WSMV and the Tennessean, will host two Gubernatorial Debates on campus this summer. The Democratic Party Debate will be held at 6 p.m. on Tuesday, June 19 and the Republican Party Debate will be held at 6 p.m. on Tuesday, June 26. Both events will be held in Belmont’s McAfee Concert Hall, televised on WSMV and live streamed via the Tennessean’s social channels. For more information on both events and to secure free tickets, click here. Due to circumstances outside of Belmont’s control, the Republican Primary Debate scheduled for Tuesday, June 26 has been cancelled. 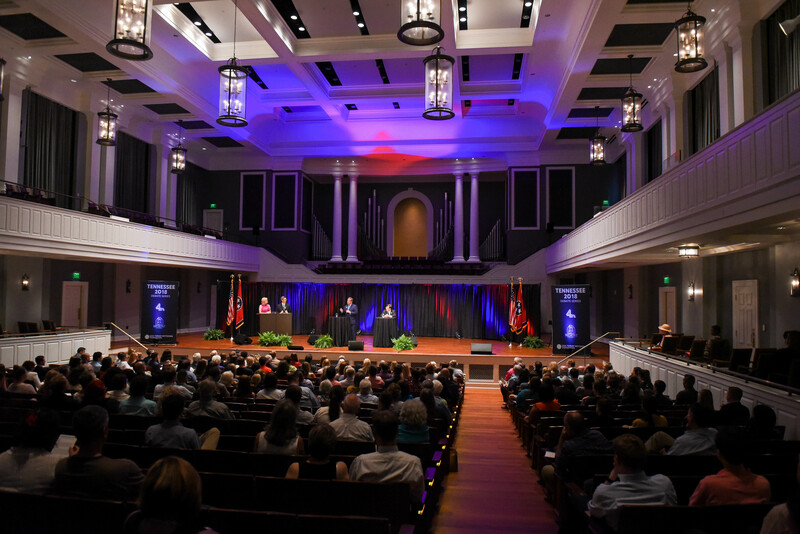 Belmont looks forward to hosting a general election gubernatorial debate on October 9 and are committed to serving as a gathering space for future conversations critical to Nashville and Tennessee.